an internationally renowned photographer by your side. Adobes Photoshop CS3 comes with powerful new features with huge payoffs. But it can be overwhelming to learn, even for professional photographers, graphic designers, keen amateurs, and others who already have an initial grasp of Photoshop. Acclaimed photographer Martin Evening, who wrote the best-selling previous books, ‘Adobe Photoshop for Photographers’, makes it easy with this new, thoroughly updated edition. * Illustrated throughout with before-and-after pictures more than 750 professional, color illustrations! * Includes images selected for you to experiment with to get you up to speed with everything in the book, including the new Photoshop CS3 features, fast! Get the preeminent advice from one photographer to another as Martin completely updates you on the core aspects of working with Photoshop, digital workflow, and improving accessibility. 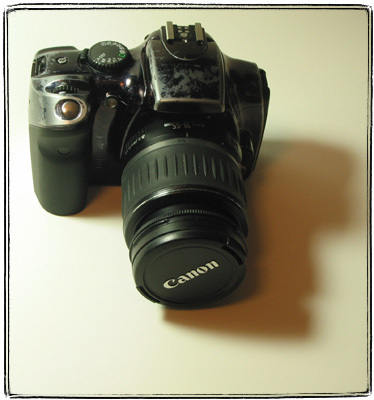 Real-life examples, diagrams, illustrations, and step-by-step explanations ensure that youre up to speed with the next generation of digital photography in no time! I often get asked for advice on what digital camera to buy. I’d estimate that I was asked that at least a dozen times in the last couple of years. I’ve been asked by co-workers, friends, family. I usually explain things this way: there are two classes of cameras — SLR and what used to be called “rangefinder“. SLRs range from bulky and heavy to galaxy sized black hole; from very expensive to small-Manhattan-studio-apartment-down-payment expensive. Rangefinders range from 007-spy-camera-sized to brick-sized; from very cheap to pretty damn expensive. The image quality on both types ranges from crappy to very good. SLRs have one huge advantage: they look professional. And expensive. Two advantages. Well, actually while we are at it, there is a third advantage, and the only one that matters. Some SLRs come as a part of a camera system. A camera system is a collection of accessories that your camera can take. It includes lenses, flashes, extension rings, adapters, and other various obscure doodads like focusing screens and right angle viewfinders. Repeat with me – it’s not the camera body and the lens it comes with. It’s the System that matters. When you are buying a non-system camera, you have to make a one piece investment as you won’t be able to upgrade it later. With system SLRs, your investment in lenses, flashes and other accessories is separate and much longer lasting than investment in the body of the camera. More than that, you’ll have a choice of several camera bodies at different price points. But the main thing is, you can have a lens and accessory collection and it will stay with you for many years. In the olden days there were popular rangefinder systems and even TLR systems. Not anymore. But the main reason for rangefinder popularity still remains: they are smaller and easier to use than SLRs. A picture taken with a well-made rangefinder will be almost indistinguishable from that taken with a well-made SLR with a normal range lens (that is, not a macro or telephoto or something even more exotic). Rangefinders add something to photography that no SLR can add – spontaneity. To be able to whip a camera out of your shirt pocket and take a picture is priceless. 70% of photographic opportunities disappear in the time that it takes to take an SLR out of the bag. I often try to steer people into buying a nice rangefinder because I know that they’ll take it with them more, take more pictures and enjoy it more. A camera that wants to stay at home is not of much use, unless, of course, like me, you are Ok with dragging a heavy bag with you everywhere. If it’s the SLR that they want, I explain the choice even simpler. You have to buy into a major camera system, which these days means Canon or Nikon. Once you buy your camera and lenses, you are pretty much stuck with the system, unless you never buy any expensive lenses. Canon and Nikon systems are pretty equivalent in quality and variety. They are both awesome. Generally Nikon stuff is heavier and sturdier, and also more expensive. Just about anybody finds that appealing. I find the relative heaviness a huge drawback. Picture quality at slow shutter speed is mainly limited by three factors: sensor quality, lens quality and camera shake. So, if you are not using a tripod for every shot, a heavy, although sturdy camera is a huge drawback – it will make your hands shake a lot more than a lighter one. For these two reasons I am, and always was a fan of Canon. Most of the people I ever advised on purchasing a camera bought Nikons though. More than that, most of my friends and co-workers are Nikon owners already. As a rule of thumb, prosumers that I know like Nikons. In general, among professionals and amateurs, Canon and Nikon are represented equally, as far as I can tell. I do have one observation that might raise a lot of controversy. I find, in my empirical observations, that Canon owners take and share way more pictures than Nikon owners. Nikons are usually found stashed away at home, while Canons are out there in the world, taking pictures. Since 2000, I took about 25K photos, and a I guess I am a typical Canon user. So is Travis Ruse, one of my favorite photobloggers. So is Tema Lebedev, my favorite travel blogger. What about you, Nikonophiles? Where are your pictures? Philip Greenspun has a nice technical Canon vs Nikon comparison, as well as a good description of the Canon system, and one of Nikon. I’ve added a camera-related poll. Fujifilm blimp moored over at Floyd Bennett Field. 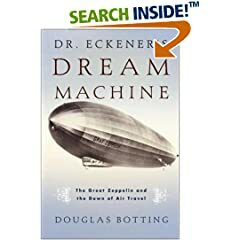 * As it turns out the word “blimp” comes from the sound that occurs when one flicks the skin of a balloon. * Poor Fujifilm branders. 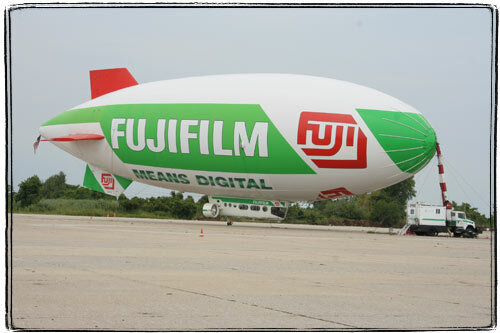 To most people “Fujifilm” means “film”, not “digital.” It’s kind of like branding with the slogan “Luftschiffbau Zeppelin GmbH means safe transatlantic flights.” That’s not what people remember, is it? * Actually, Fujifilm makes absolutely awesome laser exposure printers for digital photos. They basically use lasers to expose regular photo paper, resulting in a digital print that has all the characteristics of a regular print. Unfortunately most digital photo printing services don’t let you know what kind of printing equipment they use or at what resolution they print. I started this blog in May of 2002. I got my first digital camera around this time as well. So, it’s time to look back at my 3 years of blogging and 3 years of digital photography. My mostly backed up (is yours?) photo folder holds about 27 gigabytes of photos, which translates into about 16,500 files (I use Picasa to organize them and a usb drive for backup). That’s about 458 rolls of 36 exposure film. At 5-6 bucks a pop for film and then a couple of bucks for processing that’s a lot of mon-ay. Of course I print a lot less and mostly show pictures in the blog, but still this is a huge economy. In three years of blogging I wrote 824 posts containing 117,274 words. Considering an average of half an hour per post that’s about 50 eight hour work days. That is a lot of time, people. 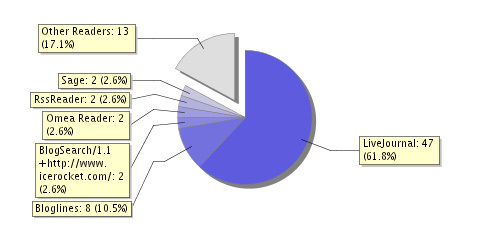 Considering that I do not write posts at work, this is a very sizable chunk of my free time. I could have written a book in this amount of time. According to Feedburner my current readership is puny. 47 (a special number, isn’t it?) livejournal readers, 8 from Bloglines, and a couple of others, some of which are probably bots. When I hosted my site in Livejournal it seemed like I had about 250 readers, but as it turned out most of those were just “you added me, I added you” kind of deals. Even then I was far behind Ripley the Cat (and I find it very hard to get over this fact). So, sob story about the number of readers aside, now I am a member of the elite group of bloggers who have been doing this for 3 years. How elite, you might ask? Let’s ask Mighty Google. 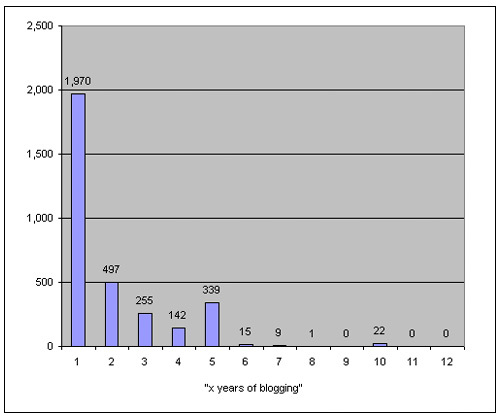 Here is a graph of how many results come back to “x year(s) of blogging”, where x is “one”, “two”, “three”, etc. This, of course has just a slight correlation with the number of years people have been blogging, as “hundred years of blogging” brings back three results. My website that hit the Information Superhighway back in 1996. It helped my future wife find me and gave me some rudimentary skills for my first web job. The blog hasn’t been so useful or popular, it seems. Maybe back then there was less good content on the web, and now there are shite waterfalls of it. Or maybe I need do something to market it. Like asking my staunch 47 + 8 + x readers to link to their favorite post or two (all of the old posts are searchable from http://www.deadprogrammer.com). Right? Even though I am squarely in the EOS camp, I have to note that Nikon usually does not force the indignity of owning a silvery plastic camera on the buyers of lower end models of their slrs. Dear Canon, please fricking stop using that silvery plastic! This might not have been the best idea as the resale value of my $800 camera suddenly took a nosedive, but the “paintjob” turned out to be remarkably durable (it only came off around the shutter button and the top a little), but also gave my camera a mean, grungy look that I like a lot. I think I will buy some Krylon Fusion paint and do a less half-assed jobs. There are people out there who used similar paint to modify old silvery rangefinders. This is hard to believe, but there are Nikon lens to Canon camera adapters. I think I’ll buy one – I do not own any Nikon lenses, but have a lot of friends that own some pretty expensive ones. By the way, this might start a small flame avalanche, but in my experience most of the people that I know who own Nikon SLRs brag about having many very expensive lenses, but for some reason do not take a lot of pictures. Canon owners tend to have few cheapo lenses, but have pictures coming out their wazoo. (by the way, dictionary.com’s explanation of etymology of wazoo is not very convincing). UV Filters considered harmful. I was never a fan of putting a glorified piece of window glass in front of my lens, but could not figure out why. Now I know. (I think I snagged this link from Kottke). Making a lens out of an old magnifying glass and free time. This is some fine ducttapemanship. Does Your Digital Camera Have Enough Bling? I was researching subminiature digital cameras when I stumbled on a webpage of a company that makes an affordable diamond studded digital camera. That’s right. 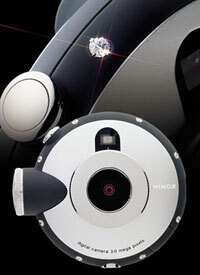 MINOX DD1 Diamond has 8 synthetic diamonds. Mechanical watch manufacturers used to proudly advertise how many synthetic “jewels” were used in the watch mechanism. Then radio manufacturers used to brag about the number of transistors (sometimes even adding unnecessary transistors to the circuit). Now it is all about megahertz, megabytes and megapixels. Don’t you think it’s time to go back to jewels? Siliconfilm is still pumping out vapor, but Canon already has an 11 megapixel full 35 mm frame camera. And in a few years maybe I’ll be able to afford it. Because of those Siliconfilm jerks I did not buy a digital camera for so long hoping that I could convert my film camera.